Federal-Mogul Corporation Athens needed a press able to remove the company’s shaft seal parts after they were pressed. Failing to find a company offering such a press, Federal-Mogul turned to Wabash MPI for help in designing such a machine. The facility in Athens, AL already utilizes several Wabash presses. Wabash was able to design a press with the top knockdown/part discharge feature Federal-Mogul needed to produce these shaft seals. Federal-Mogul Corporation supplies products and services worldwide to original equipment manufacturers who use those components in vehicles and automotive systems as well as to aftermarket customers selling replacement parts in repair shops and retail outlets. Federal-Mogul Corporation Athens (Federal-Mogul) is part of the corporation’s sealing systems division. This division provides sealing solutions for complete engine, transmission and driveline systems, including sealing and NVH modules, LEM and MLS cylinder head gaskets, thermal acoustic protection and dynamic seals. Several other facilities in North America and facilities located in Italy, Hungary and China are also part of the sealing division. Federal-Mogul needed a press that was able to remove the seals once they were made using a top knockdown/part discharge feature. “Product design dictated that we had to have this feature on the presses and we were looking all around for it,” says Marvin Johnson, Project Engineer at Federal-Mogul. They were unable to find a machine with the features it needed, so it approached Wabash MPI about designing one. Wabash supplied two new vacuum shroud presses to Federal-Mogul, meeting the facility’s needs with a top knockdown feature, which knocks the dynamic seals from the surplate. The presses mold various elastomer compounds, dependent upon the product and application, to a metal insert. Operators use loading boards to load the “metals” and elastomer preforms into the press cavities. After the molding cycle, an eject plate automatically shuttles in and removes the molded parts from the cavities. This shuttle assembly accommodates all of Federal-Mogul’s molds and adjusts for a wide range of positions. The shroud style vacuum chamber also accommodates all of the company’s molds. 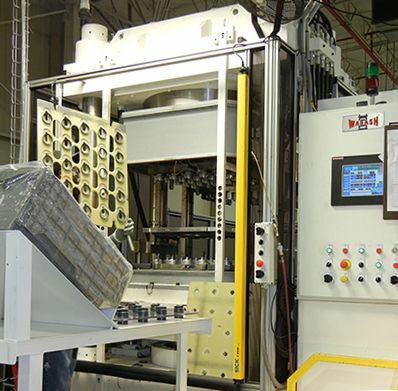 Post molding operations are then used to machine, assemble and complete the seal for use. This Federal-Mogul facility actually has 12 Wabash presses total, including the two latest presses. The other Wabash presses produce seals with similar designs and applications to the new presses, but each project the company receives may call for a different shape or rubber, so small differences are common. And although the new vacuum shroud presses were built specifically for the current shaft seal parts, they can run any of the molds from the facility’s other Wabash presses. Federal-Mogul and Johnson initially worked with Wabash around 1995 to replace some of its older presses which needed to be continually rebuilt, and whose manufacturer was no longer in business. 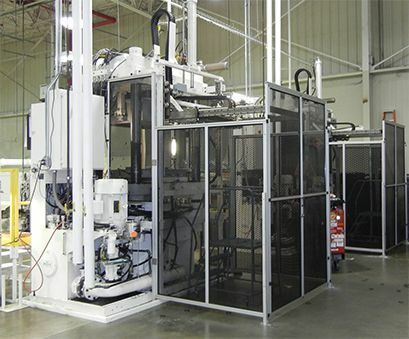 Federal-Mogul began to look for new molding presses in the same size range as its previous machines and found Wabash MPI. Federal-Mogul’s experience with Wabash has been positive and the company has continued to work with Wabash since those first presses. “They were willing to work with us to get the issues, as we found them, corrected and improved as we’ve gone through the years,” states Johnson. Federal-Mogul had done some of its own improvements to several of their press controls and collaborated with Wabash to integrate those improvements into the control features of the two latest presses. Using the first presses as a template, and after years of working with the presses, Johnson and Federal-Mogul were able to work together with Wabash on the controls and their screens to enable these improvements. Wabash is an international manufacturer and supplier of standard and custom hydraulic presses including compression molding presses, liquid injection molding, vacuum molding, transfer molding, ASTM, composite molding, laboratory and R&D presses. All electric compression presses are also offered and are suited for performance in a lab or production floor. Wabash provides standard, special application and custom presses to meet customer’s specific requirements.